Villa Peura Main house Guest House Other premises Location Interested? 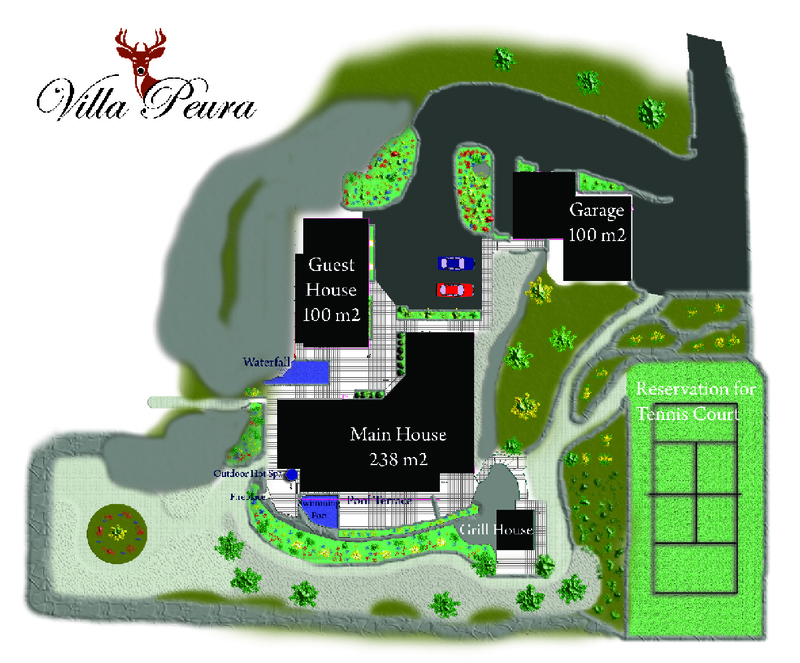 Villa Peura was built in 2005 on a beautiful half-hectare, or roughly a 2.5 acre lot. Villa Peura consists of a 238 m2 main house, an 85 m2 side apartment, a 15 m2 maintenance room and a 99 m2 outbuilding where the garage, gym and wine cellar are located. The whole thing is crowned with a beautiful yard with its grill house and pools. The main house is built on a wooden frame and decorated with white tiles. There are five entrances to the Villa, three from the terraces and two from the inner courtyard. In addition to three bedrooms, there is also a luxurious and spacious Master-bedroom with an adjoining, large bathroom. The side apartment is likewise built on a wooden frame and finished with white tiles. The apartment features a bedroom, a living room, a kitchen, a dining room for 6-8 people, and a movie theater. The high-end movie theater is built with sound and picture quality in mind: adjustable lighting with a dimmer switch, adjustable mechanism chairs, DTS 5.1 audio by Genelec, and FULL HD-projector with HDMI-connection. Both houses have class A alarm systems installed, an electronic fire alarm system, CAT-5 data connections, mechanical ventilation, and heating based on circulation of hot water.